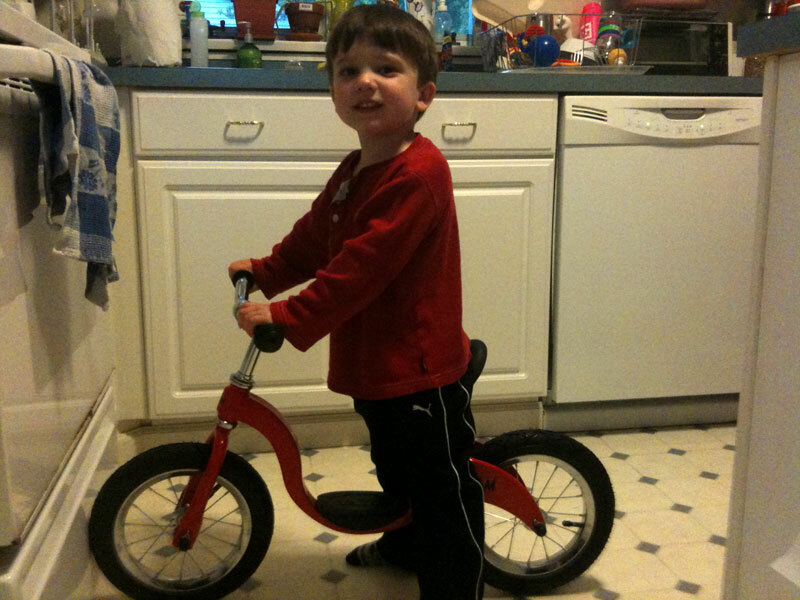 Seth Turns Four - and Gets a New Bike! We can hardly believe that Seth turned four years old today! I was just re-reading our blog entries from the day he was born, and it's so hard to believe he is a big boy now and not a little baby. Though I tell him he will always be my baby, he is more interested these days in being called a big boy (remember, after Evan was born, he wanted to be called a "little guy" even though he was still Evan's big brother). There has been lots of talk in the Healy household over the past few weeks about Seth's approaching birthday, and to say he was excited is an understatement! Seth has a party for his friends coming up on Saturday at Bouncetown, and a party on Sunday with his grandparents, but today was his actual birthday. We woke him up (yes, both boys actually slept until 6:45 am and had to be woken up!) by singing happy birthday to him in his room. He was surprised by this, and lounged in his bed for a little while, until we told him there were some surprises for him downstairs. At long last, Seth got his new balance bicycle! We had it all set up for him in the kitchen, and as he looked at it, he was very happy. He said "This looks familiar!" Then he told us that it was just what he wanted. A balance bicycle has no pedals, so kids use their feet to push themselves - it is supposed to teach them balance. Since today was a rainy day, and the bike hadn't been outside yet, we let him ride it around in the house (with our assistance, though he was pretty good at it! ), and he was immediately taken with the bike. He had wanted a red bike, and this one was mostly red, but as Seth was quick to point out, "It's red, black and silver, and I like red, black and silver!" There was also a memory box we had made Seth with a big picture of himself, and some birthday cards that we put inside the box. Seth also got to have peanut butter waffle for breakfast - his favorite breakfast. Yesterday, we had made brownies together for Seth to take in to share with his friends at Tiger School. So we took the brownies in today, and he was very proud to share them - chocolate brownies, chocolate frosting, and red sprinkles! He had a great morning at Tiger School, and his friends sang him happy birthday. His teachers gave him a rainforest book, which was so sweet. Since I don't work on Tuesday afternoons, we got to spend the afternoon together. While Evan took a nap, Seth and I had fun with his bicycle, talked, and snuggled and watched the Winnie the Pooh movie together. Seth got lots of birthday calls from family and friends - he is a very loved little guy (or big boy, I should say!). Today was a Geema day, so Seth also got to spend the afternoon and evening with Geema. She gave Seth one of his presents - a Winnie the Pooh book, which he loved. We all got take-out dinner together before I had to go into work, and Seth chose his favorite - butter pasta and chicken tenders. We are so blessed to have Seth and Evan in our lives, and it was fun to be able to celebrate Seth's birthday all together. I am sure this weekend will bring lots more fun for the birthday boy! Seth was very happy to be able to celebrate his birthday with Evan - the boys are really getting along so well lately, and Seth loves to have fun with Evan.